Anyone still looking for thanksgiving recipes?! I know it seems a wee bit last minute, but I’m someone who procrastinates quite a bit, so if you’re like me you’re still perusing the internet for next week’s feast. :) We have a Maple Chiffon Pie today. Chiffon pies are pretty awesomely old school and I appreciate them. I like how they have a lighter then mousse texture, but still hold a ton of flavor from the custard base. We flavored ours with maple syrup because ’tis the season, right? 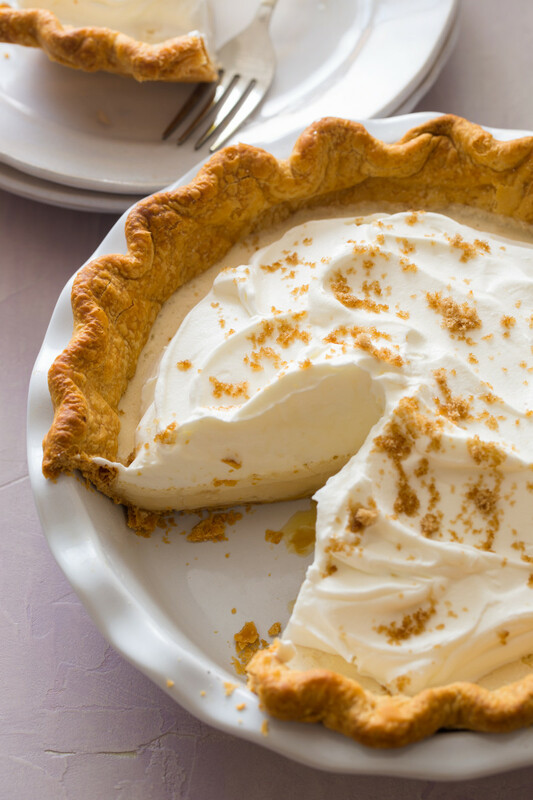 This pie is a little bit fussy, but definitely worth the effort especially for a fun dinner party or get together. 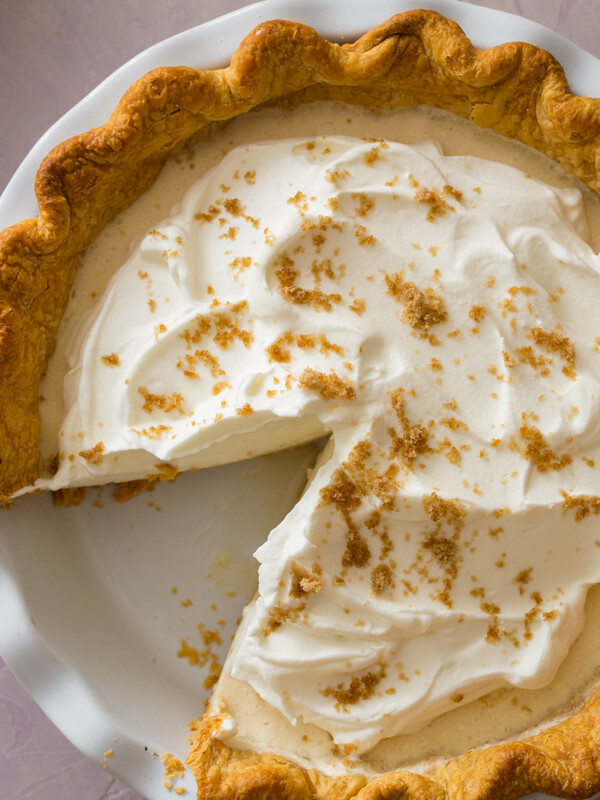 The maple sugar/brown sugar on top is my favorite part; it adds such a nice crunch to this super smooth pie. We hope everyone has a warm and cozy thanksgiving…but don’t worry, we still have more to come!! 2. For crust: Place flour, salt, baking powder, butter, and cream cheese in a food processor and pulse until a fine meal forms. While pulsing, add water and vinegar and continue to pulse until dough forms. Dump dough onto a clean surface and form into a disc. Tightly cover in plastic wrap and refrigerate for 30 minutes. 3. Lightly flour a clean surface and roll dough out into a 14” circle, about 1/4 inch thick. Gently place and press dough into a 9 inch pie dish, trimming off the excess dough. Refrigerate for 30 minutes. 4. Line the bottom and sides of the pie dough with parchment paper and fill with dried beans or uncooked rice. Bake crust for 15 to 20 minutes. 5. Remove beans/rice and parchment from the par-baked shell and continue to bake for an additional 20 to 25 minutes or until the pie crust is golden brown all the way through. Remove from the oven and cool completely. 6. For the filling: Place egg yolks in a double boiler and place over medium heat. Whisk yolks until they begin to thicken, 5 to 6 minutes. While whisking, add maple syrup, milk and salt and continue to whisk until mixture is thick enough to coat the back of a spoon. 7. Transfer custard to an ice bath, stir in gelatin mixture and cool completely, stirring occasionally. 8. Once mixture is fully cooled, beat egg whites and sugar until stiff peaks form. Fold whites into the custard until fully incorporated. 9. Beat cream until medium peaks form. Fold half the whipped cream into the custard until mixture is smooth (refrigerate remaining whipped cream). Pour custard into the cooled piecrust and refrigerate for about 4 hours or until filling sets. 10. 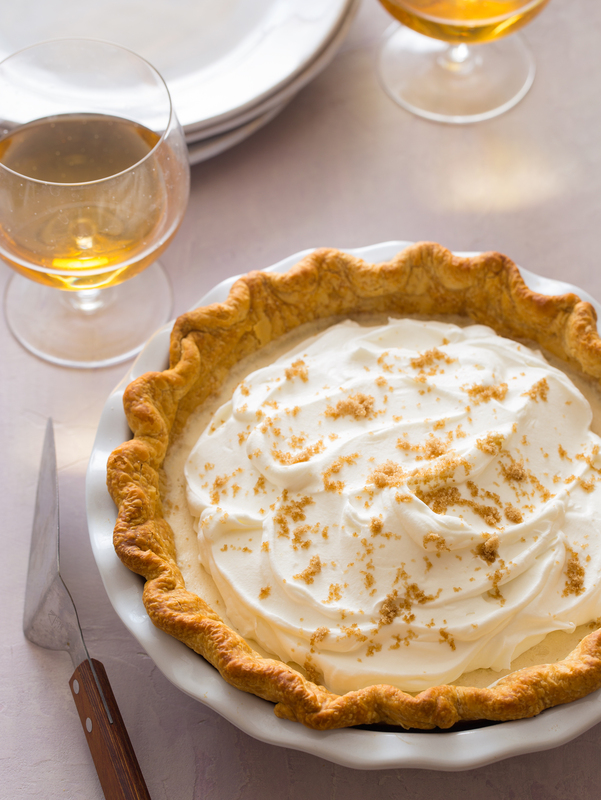 Top pie with remaining whipped cream and finish with a generous sprinkle of maple sugar or light brown sugar. Slice and serve. Making this for Thanksgiving! Y’all COME!! That looks so stinking good!! I love pie its beyond my favourite!! Help! I have tried to make this filling twice and it never came close to making a custard. The first time I started with the eggs in the double boiler first and as they thickened added the maple syrup, warmed milk and salt. After 45 minutes stirring I gave up. The next time I mixed the eggs with the milk mixture first and then added it to the double boiler. Once again I stirred for 45 minutes and it didn’t thicken so I pulled it off and put it in the ice bath to add the gelatin. (By the way, you didn’t include adding the water to the gelatin in your instructions) That didn’t work either so I threw it all away and am left with the pie crust. Would love to know where you think I went wrong. Sure sounded like a good, different pie for Thanksgiving but I will have to wait until I figure things out more. Next time I would raise the temp of the heat a bit more after you add the milk and syrup. It helps to thicken the custard faster and if you’re consistently stirring, you shouldn’t have a problem with scrambling. Also, the custard won’t be super thick, like regular custards. It’ll be a little thinner (still thick enough to coat the back of a wooden spoon, but not thick enough to sit on itself). Did you try making the filling completely? With the beaten egg whites and whipped cream? I hope so, and that you didn’t just throw the semi-made filling out! The addition of both will help set the gelatin/filling overall and leave you with a light and airy textured treat! This was just delicious. I made for my family’s party and my wife loved it. It’s light and fluffy, not runny. I don’t see the directions on where & when to do anything with the water & gelatin. I had a recipe like it & you were to mix the water & gelatin & set aside then mix with egg & maple ? guess I will try it that way.